Note: Build working in 3.0, ENERGY SHIELD NERF. Works good with Witch - Occultist = more defense or Necromancer = more DPS. You also can use Scion or Templar using Guardian. Hi, today I would like to show a support build, I'm playing with it and enjoying it, this build buff a lot of dps and the survival is good. Remember that only serves to support, it doesn't have any type of attack, so you can't play alone. I don't advise you to start playing with this build before level 80, because it will be really hard and stressful, after reaching level 80, reset the tree, first take all reduced mana reserved and then energy shield / jewel socket. • You're an Aurabot - Everyone loves you. • You can run any map. • You don't have to be afraid to die to reflect or corrupted blood. • You just need to run. • You're an Aurabot, so you can't play alone. • It can be annoying to find some items, especially in new leagues. • If you are mapping with random players who do not know the power of the support build, they can die for reflect with a single attack. • You don't have any kind of attack, your only goal is to run behind the players providing auras (I like it). 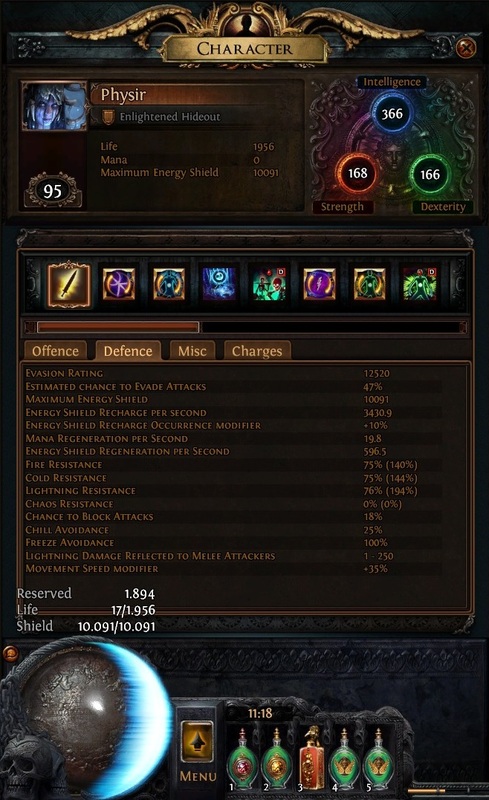 3.0 ENERGY SHIELD NERF, NOW I GOT 7200 ES!! Hatred - Anger - Wrath - Haste - Grace - Discipline - Vitality - Dying Breath - Enfeeble - Temporal Chains - Clarity - Shaper's Seed. I've already changed the build several times and what I pleased most was this. The support build can be done in several ways, in my case, my focus is on doubling or tripling the player's damage. Kill all Bandits! We don't need any stats from bandits. Why are you getting all reduced mana points? Because we need all reduced mana reserved nodes to run auras. Jewels with % maximum ES, dex (You will probably need) and resists (if you need). I got 3 vaal haste, 1 vaal summon skeleton and 1 vaal discipline. I'm going to try this build today! Without ~90 orbs of regret, how would you suggest leveling alone? And do you think this would be a good weapon to use until Level 68? Do you got some videos? I really like to see your build in action. I don't advise you to level up with this build, because you need to focus all points in reserved mana reduction. Dying Breath is really good, 18% increased damage is amazing, the first time that I make the build I was using DB but you need change the auras and use only one curse, i'm using 2 curse (Enfeeble + Temporal Chains -> OP) because the shield prism guardian help a lot with mana reserved. Dying Breath = 11 auras + 1 curse. If you wanna use Dying Breath you can, but Ephemeral Edge gives you 50% increased energy shield, help a lot with survival, I have 9235 ES and 8407 without EE (Still good). You should use at least 3 Enlighten, two lvl 3 and at least one lvl 4, because you need life to cast Lightning Warp (at least 30 life).